"CWM is a company built on its beliefs and values, which helps them to be distinguished as a professional motor trading company. They conduct business in a responsible friendly and ethical manner. One of their values is to ensure each customer receives excellent customer service from start to finish and that their overall experience with the company has been honest, enjoyable and satisfying." 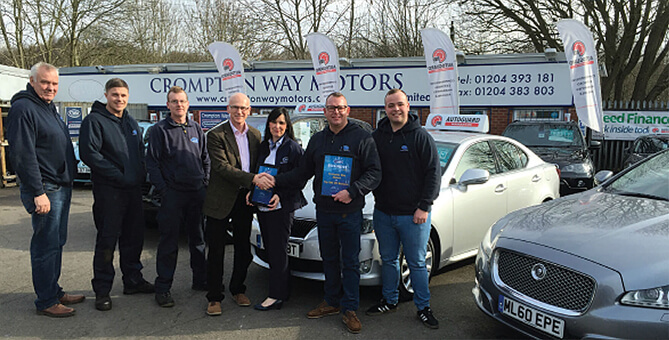 Here at Crompton Way Motors we fully understand what's most important to our customers which is why customer service is at the top of our list of priorities we aim to go THE EXTRA MILE with each and every one of our customers ensuring they have the most memorable experience when buying their car from Crompton Way Motors. We now have many repeat customers who return to us when it's time to upgrade to a new model and have over 1000 positive customer reviews. At Crompton Way Motors we are very particular about the stock we source so that you the customer are only offered the best vehicles for sale. Due to our history and experience within the motor trade we have great relationships with the main car franchise dealers which enables us to source all our cars from them and never auction houses this way we can guarantee the vehicles on our forecourt have clean histories and are fully HPI checked for your peace of mind. All our cars are lovingly inspected when they arrive on site using the latest state of the art equipment, we carry out a full 100 point check prior to your car being delivered. We also fully prepare your new car using the best valeting products on the market to ensure when you collect your new pride and joy you are 100% satisfied. With over 30 years of experience within the motor industry having managed multi franchise business for Rover Audi and VW. Very impressed with service overall would return in the future + would recommend to others.